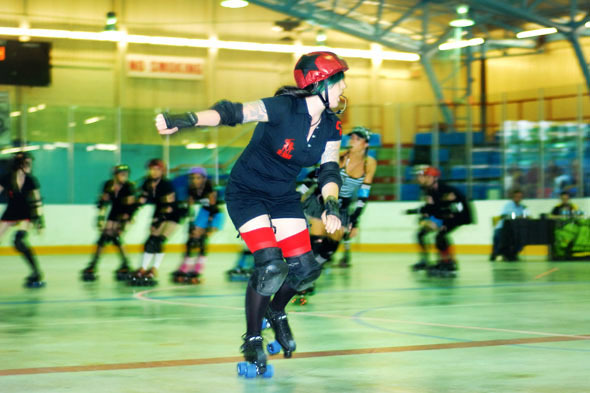 The Toronto Roller Derby story begins in 2006, when two groups of girls, the Smoke City Betties and the Toronto Terrors, independently formed teams and began skating. In April of 2006, the Terrors hosted tryouts which resulted in the formation of four new teams: the Bay Street Bruisers, Chicks Ahoy!, the Deadly Viper Assassination Squad and the Death Track Dolls. 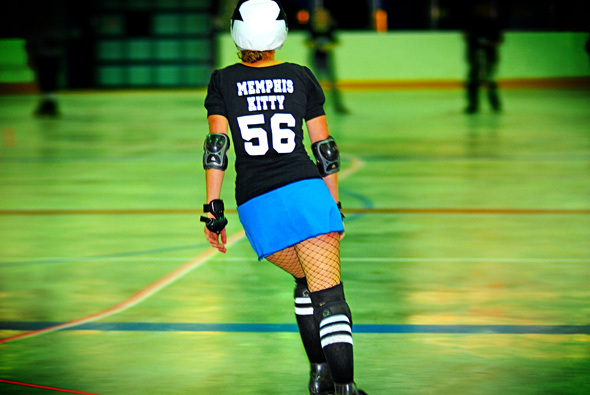 The Betties also kept recruiting and growing over the summer, bringing us our sixth team, the Gore-Gore Rollergirls. In August, they joined forces and the Toronto Roller Derby League was born! According to their flyer, this is the largest league in the world. I find that a little surprising, but Toronto does have the largest Pillow Fight League in the world, so I guess anything's possible in this town. The first thing that struck me upon arriving, was the taped out track in the middle of the arena. I'm not sure why I pictured an inclined track with railings, but this form of derby uses "The Flat Track" and is apparently straight outta Austin Texas! Basically, there is a wall of skaters called the pack which is made up of both teams. The two skaters at the front are called Pivots, and the six behind them are Blockers. 20' back are the Jammers, who earn points for every successful pass through the gauntlet of elbows, hip checks and random violence that is the pack. This is called a Jam and it last up to 2 minutes. A full game is called a bout, and is made up of three 20-minute periods. Bay Street Bruisers vs Chicks Ahoy!